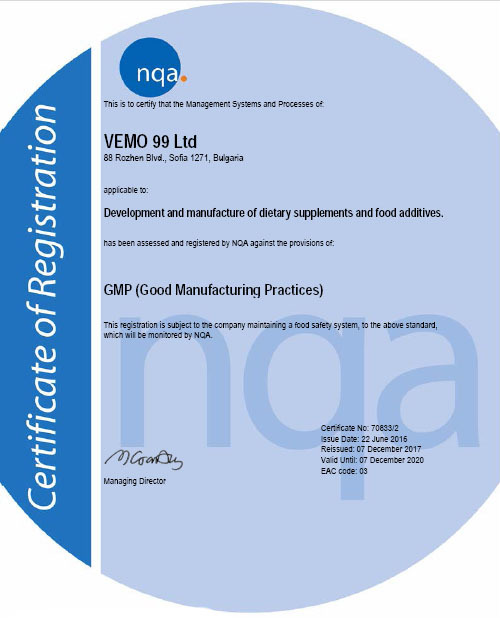 VEMO 99 Ltd relies on perfectly trained biochemists and seasoned consultants with long-standing experience, who are in charge of the R&D department. The laboratory keeps all the necessary equipment needed for all analytical characteristics determined by the indicators, standards and analytical methods embedded in the Company documentation, which are completely sufficient for the full characterization of the raw materials and end products. The closed production cycle, i.e. 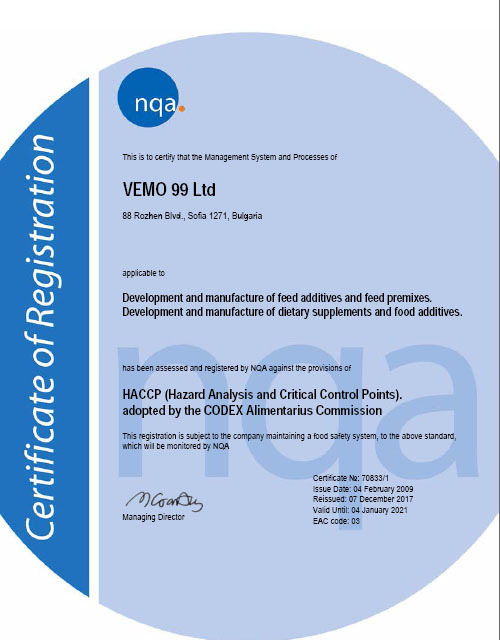 from raw materials to the finished goods, allows VEMO 99 to maintain complete control and analytical technology, as well as minimize production costs, thus ensuring the highest possible quality for the customers and enabling the company to offer fairly competitive prices for the worldwide market. 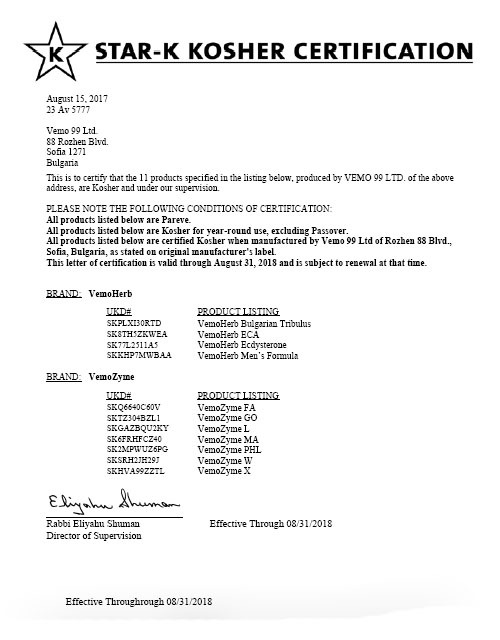 VEMO 99 Ltd's production process is in line with all regulatory requirements. 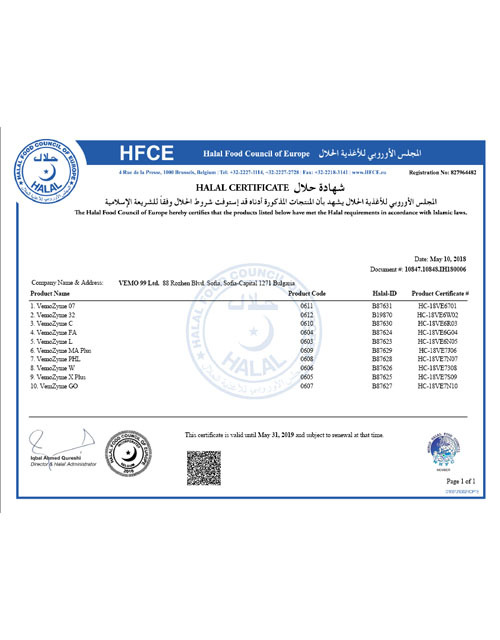 Our products have been registered and approved in compliance with the regulations in each individual state. The company undergoes regular inspections by the respective authorities and strives to meet global level quality standards. 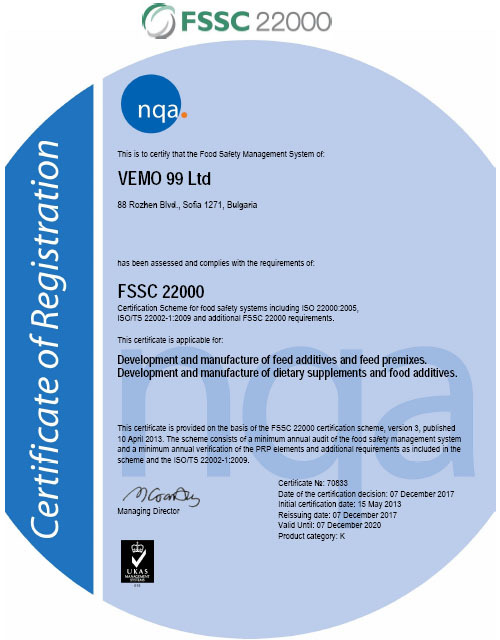 VEMO 99 Ltd is an EN ISO 9001-2015, HACCP, FSSC 22000, GMP, GMP+, HALAL and KOSHER certified company. VEMO 99 Ltd is a flexible organization aiming to provide the best quality at reasonable prices. The best way to achieve that bold task is by recognizing the specific needs of our customers. Thus, we can come up with solutions that perfectly fit the market needs, leaving no room for unnecessary additional costs. We customize our products depending on our customers' requests and with the help of our experts in the relevant field, the final result is exceptional. Each and every product offered by VEMO is a result of many years of experience, research and development. There are numerous field trials performed all over the globe to confirm the effectiveness of the products in practice with different feed materials and under different conditions. Many of our reports are performed in Research Institutes by professors in animal nutrition. Some trials are performed by our clients, which enables them to prove the results first-hand. We will be happy to provide you with the trials and reports of our products upon your request.